The steel frame construction and gear material of this 20 inch NaceCare carpet scrubbing buffer will give you years of rugged use. It's great for scrubbing hard floors, but also useful for carpet scrubbing/bonneting with an appropriate carpet bonnet and bonneting solution. With it's light weight and large transport wheels, this rotary floor machine allows you to travel effortlessly from one job site to the next. The 1.5 horsepower motor and the double planetary steel gear transmission come backed with a 3 year power train warranty. 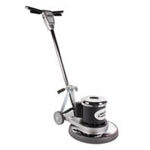 If you're looking for other great brands of floor buffing machines, check out our other 20" floor scrubbing machines. You're sure to find one to fit your specific needs.